Only the items listed above have been modeled and will be directly detected. This demo showcases AKIN's ability to detect these items when they are written in a wide variety of ways, including typos, misspellings, grammatical errors, or unexpected composition. In October I’d like to fly to Seattle… say… on the 18th… leaving from Oakland… show me flights on delta leaving in the morning. The following examples illustrate some ways a person might ask about flight information. They show how AKIN can adapt with agility and tolerant of a wide diversity and variation of human expression. This is "built-in" intielligence. Notice how AKIN is able to adapt to rambling and disjointed speech that is more like real-world scenarios. Most of us don't talk like robots. Our software and robots should be able to adapt to us instead of us having to become robots. Also notice that AKIN is able to very intelligently extrapolate values like numbers, ordinals, and dates without any training necessary. 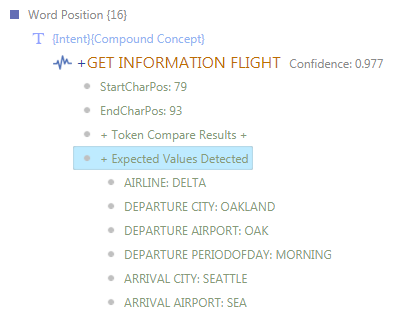 It can also even infer dates from surrounding context and assign them to the appropriate expected value types. To see how it does this, just copy and paste the example below into the input text box above and click the "Analyze Text" button, or create some of your own. While certainly not perfect, AKIN takes accuracy and agility to a whole new level and sets the bar very high. In that vein, we challenge you to take the examples below and put them into any of your favorite personal assistants and see how well THEY can handle this input. In October I’d like to fly to Seattle… say… on the eighteenth… leaving from Oakland… show me flights on delta. I'm thinking of going to Seattle in july probably around the 18th. Id be returning later in october around the 25th. Id like to see flights on alaska. I want to go to seattle. I'm in oakland now. I want to see flights leaving on the 5th of next month and be back on the 13th. Lets fly on Alaska and leave in the morning, but I want to get back in the evening. I want to go to seattle on the 23rd of next month. show me flights leaving oakland at 10:30 a.m. and arriving in seattle at 12:30 pm. Oh, and id like to fly American. What flights are leaving los angeles in the morning at 9 and arriving in seattle at 12 in the afternoon? I want to be back on the 15th of october from miami. I'll be flying from seattle to miami on the 23rd of june. show me flights on american... oh and id like to leave in the morning and return in the afternoon. Show me flights from seattle to Miami on Alaska airlines leaving on july 23rd. Id like to depart at 10:00 pm and arrive in miami at 6:00 a.m. id like to come back on the 15th of august at 8 p.m.